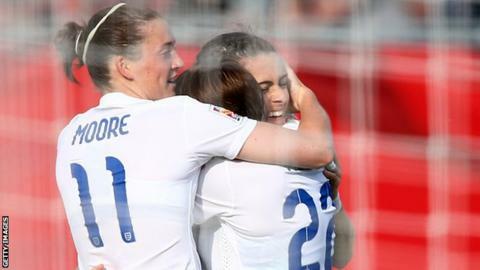 The Women's Super League "needs to capitalise" on England's recent success at the World Cup, says Birmingham midfielder Jade Moore. The 24-year-old was part of Mark Sampson's squad, who finished third at the recent tournament in Canada. Record crowds turned out on Sunday to watch the first domestic matches held since the players returned home. "Everyone always says supporters come when you achieve something," she told BBC Sport. Moore says the league must now find a way to sustain those numbers and make sure the game benefits. "All the clubs in the WSL 1 and WSL 2 need to really capitalise on it and really start getting people through the gates and realising that it's not just nationally where the women's game's good. It's domestically as well." England's third place finish at the tournament was the second best performance by an England team following the 1966 win by the men's side and eclipsed the 1990 men's team, who finished fourth in Italy. The Lionesses' success in Canada grabbed the nation's attention, with the BBC's TV coverage attracting more than double the audience of Women's Euro 2013. There was also a knock-on effect on the number of supporters going to games, with the average attendance of Sunday's WSL 1 matches being 78% higher than the average for the first half of the 2015 season. Moore added: "For us out there at the World Cup to go and win a bronze medal and come home third in the world is only going to do the women's game justice for once".